In 2009 the NYSBS Board recognized the need for a way to distribute designated grant funds to researchers who were undertaking scientific studies relevant to the interests of the NYSBS. A grants committee was established. The committee was interested in funding work on Eastern Bluebirds as well as other cavity-nesting species, especially those that nest in New York. Rather than soliciting grant proposals on our own, the Board of NYSBS agreed to work with the North American Bluebird Society to fund grants. NABS had a process already in place to accept and evaluate grant proposals. For the past five years, and into the foreseeable future, the NYSBS has partnered with the NABS to distribute our research funds. NABS accepts and reviews, with members of NYSBS, grant proposals in December of each year. The NYSBS allocates up to $2,000 annually to fund research, cooperating with NABS to call for and review proposals. It is our goal to support projects that involve Eastern Bluebirds as well as other cavity-nesters that occur in New York. Research that takes place in New York is also given preference. The NYSBS Grants Committee would like to receive grant proposals that involve research on bluebirds and other cavity nesters in New York. If you know someone who might be interested in applying for a grant, please direct them to the NABS website. The NYSBS sponsors two Bluebird Trails in New York State. Assistance is needed on all sections of the two trails. 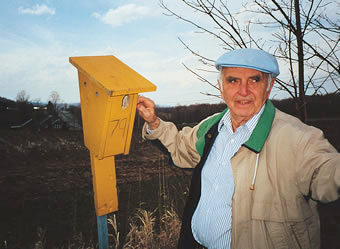 Ray Briggs, founder of the Route 20 Bluebird Trail. Photo courtesy Highlights magazine. The Rt. 20 trail was established in 1993 by Ray Briggs. 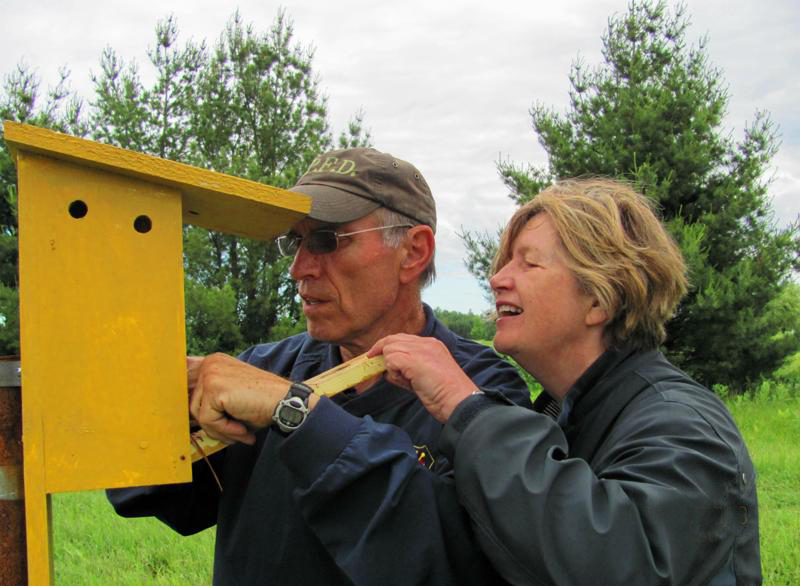 It consists of nest boxes placed from the eastern border of New York State at the Massachusetts line to the western border of New York State at the Pennsylvania border. Over the past 20 plus years the trail has fledged thousands of bluebirds and tree swallows. The trail needs volunteer monitors for all of the counties in which Rt. 20 passes through. If you would like to help restore and monitor a section of this trail, please visit our the Volunteer page. The Route 11 trail was founded in 1999 by Dave Heidenreich. It runs from the northern border of New York State at the Canadian border to the southern border of New York State with Pennsylvania. It also includes a section of Essex County. If you would like to volunteer to monitor a section of this trail in the counties of Broome, Cortland, Onondaga, Oswego or Jefferson, St. Lawrence, Franklin, Clinton or Essex, please visit our Volunteer page for information on whom to contact. Note: Rt. 11 does not pass through Essex County. This Essex County trail was added on to the “Rt. 11” trail several years ago.